Click on any photo to see enlarged version! Note: Photos are very old and their quality is not good. A project to restore them is planned for the future. 4 Guys standing on a corner with a dream! (Badly damaged photo) Left to Right: Larry Jackson (AKA: 'Mo', 'Mo-Buc', 'Mo-Man', 'Moe' ) , Marshall Bertram Murray (AKA: 'Bert', 'Rabbit') , Wendell Amprey (AKA: 'Amp', 'Wen', 'Wolf') ,Randolph Bernard Hammond (AKA: , 'Randy', 'Ham', 'Hippie'), . Photo is circa 1963-65. THE CHRYSLERS, like many Do Wops of the 50's & 60's was born from street corner singing and incidental meeting of friends. At this moment the boys are on the corner of Whitmore Ave & West Lanvale Sts in West Baltimore, MD, USA. Larry is lead singing "What's So Good About Goodbye" by Motown's famous Miracles. Between 1964 to 1974, the singing group were 'booked' and known by several similar names. We were called: THE CHRYSLORS, THE CHRYSLERS, THE 5 CHRYSLERS, THE CHRYSLERS & THE MONARCHS (recording label name with JODY ENTERPRISES), THE FABULOUS CHRYSLERS, THE MONARCHS featuring THE CHRYSLERS, THE CHRYSLERS AND THE MASCALAROS, and THE CHRYSLER MOVEMENT PLUS. "Moe" (Larry Jackson) was an acronym for "More-Man"; At elementary school- age, I was very short but had a rather large head; It's still kind of big; You think? "Rabbit" (Bertram Murray) was 1 of the fastest Track runners I ever knew. His 50 & 100 meter dashes were like a Rabbit! Very fittingly, Bert has great love for animals and nature. He was conscientious about the environment long before it became socially chic to do so. "Wolf" (Wendell Amprey) earned his name several ways, but it's mis-leading. A man nick-named "Wolf", often is stereotyped as a womanizer. In Wendell's case, while he did his share of 'sowing wild oats', many times, it was reversed roles. Women just loved "The Wolf"! An older fellow, also named Wolf (Armstrong), who had a woman-izer reputation, said Wendell and he were very much alike. He named Wendell "Wolf" after himself! Look out girls, tall, lean, talented base-voice Wolf is nearby! "Hippie" (Randolph Hammond) was so named because when not performing with the Chryslers, he was 'Leave It To Beaver' in reverse. Bell bottoms, beads, face paint, hip-huggers, symbols and loud rock music was Randy's lifestyle. In the 1960's, this kind of lifestyle was RAD-I-CAL baby! Look at any photo of Jimmie Hendricks (classic rock) and you would be more accurately seeing Randy when he was at leisure. Moe, Hippie and Wolf conceived the Chryslers. In the photo above, we added Rabbit to create a Quartet as the original group. The photo is in front of Bert & Wendell's homes and may have been Bert's 1st informal singing with us. He showed us how quickly he could pick-up what we were doing musically. Later Andre' Towles would be added to create our 1st Quintet. THE CHRYSLERS: Veterans of Radio, Stage & TV ... We grew fast! It's Circa 1968-69. 13 TV appearances, 1 single record released, many live performances. We had now become THE CHRYSLER MOVEMENT PLUS! Left Front is Bert ; Left Rear is Wendell; Centered is Randy ; Right Rear is Darnel McManus (New Kid on the block! ); Right Front is Larry. We are hot, tired & perspiring after a grueling 4 hour performance. Our managers asked us to pose for this photo prior to getting out of our, perspiration drenched, clothes. We agreed to what the managers wanted because they were the bosses and- holding our pay! Devilish rascals those managers! This may have been 1 of several occasions where 1 or more of us got dizzy spells. We sometimes nearly fainted from exhaustion & heat. We sometimes performed multiple shows at different locations on the same day! By the way, notice the big smile on Darnel (RR). After 4 hours work, he looks VERY happy & refreshed! We didn't let him out too often! Also, note the look on The Wolf (LR) & myself (Moe RF). Hot, sweaty, tired and THEY WANTED PHOTOS? &%#^%!! (Thoughts not fit for print!) I promise you, our managers AND the photographer left there alive! Unfortunately, even with sweaty armpits and all, this is currently the most viewable photo that I have of THE CHRYSLERS. This photo is the only promotional-studio photo currently available to me. I am looking for more pictures. If you can place me in contact with any of the members of these music photos please email me. If you have additional photos of these musicians or bands and would like me to publish them on my web, please contact me. If you have additional biographic information about any one mentioned in these music photos- ESPECIALLY NAMES THAT I HAVE FORGOTTEN- please contact me. If YOU are 1 of the people in these photos or spoken of and we have loss contact- CONTACT ME! 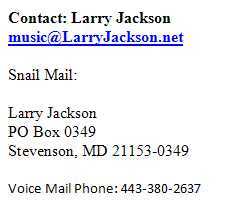 If you just like nostalgic, music memorabilia, - CONTACT ME! If you don't like my site- KEEP IT TO YOURSELF!